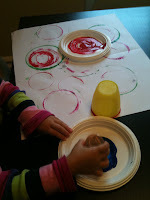 Yesterday we were all about printing circles! Big circles, little circles and everything in between. The Bee and I started this project by collecting a bunch of plastic cups from around our house. Once we had some of varying sizes, she selected five colors of paint and I poured them one at a time onto plastic plates. She then dipped the rim of the cup into the paint and printed all over the paper. The only tip I gave her was that you could print the smaller circles into the bigger circles. 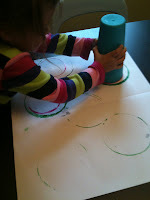 She enjoyed printing with the cups and after a while begin to experiment with what would happen if she slid or rolled the cups creating new effects. 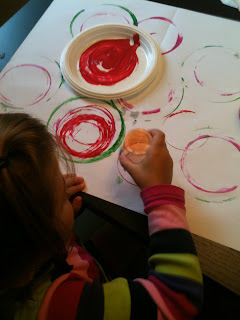 Later on I showed her the concentric circle paintings of the artist Vassily Kandinsky and she asked me if he used cups too! Pefectly fun & simple - love it! We're featuring this awesome idea at Monstrously Creative Saturday! Stop on by and grab a button! Thanks so much Mandi!!! I just added the button to my blog!! Love your blog! Glad to check it out! Is it possible to use this technique for Printing on plastic?